YouTube is the second most visited website in the world. Over 300 minutes of video are uploaded to the platform every minute!! No wonder why micro-influencers are using this platform to share their journey. Long gone are the days of 1000 word-count blogs and static images, video has been proven to make an impact much larger than we can fathom. With easily digestible material and messaging behind each video, it only makes sense that Google recently released a statistic that, “60% of viewers are influenced by YouTube influencer’s messages when it comes to purchases.” With over 5 billion videos watched on YouTube a day, this platform is becoming increasingly influential with no signs of slowing down. Micro-influencers have the ability to reach niche audiences due to their specific messaging and their community of viewers. Those speaking to areas of design, fashion, food or everyday politics are known to have a hyper-engaged and always on audience. So, what does all of this look like in a campaign? Society6 was able to reach a new type of audience due to this. By teaming up with high-profile influencers, Society6 had them review their products, cross-promote content, as well as link back to their website. By promoting each influencer with a unique 10% off discount code, they were able to track and measure performance. 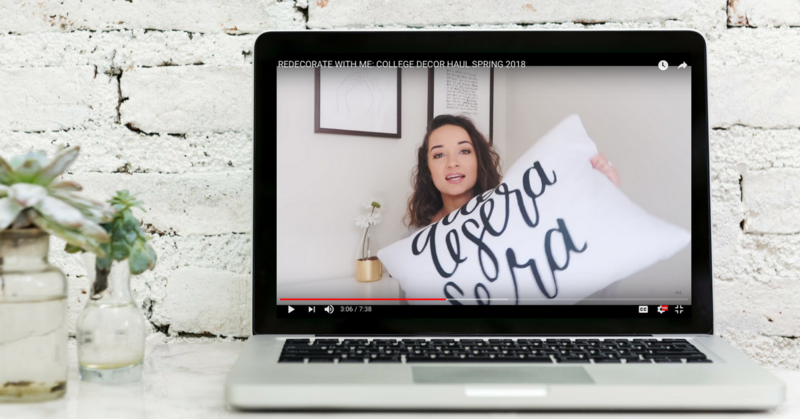 During the Society6 Spring Refresh Campaign, Society6 partnered with 7 micro-influencers to create video content featuring select products to in return drive brand awareness. Society6 is an e-commerce website that allows independent artists from around the world to upload their original designs and have their work featured on over 30 premium consumer goods. Society6 does the producing, packing, and shipping of products, but reliefs on these artists to create a variety of designs. Products range from home decor to apparel to tech accessories. Find out how Society6 received over 80,000 views by entering the form below to see their results!